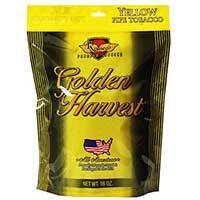 Proudly made in the U.S.A, Golden Harvest Pipe Tobacco is a bargain friendly tobacco choice that doesn’t skimp on quality! 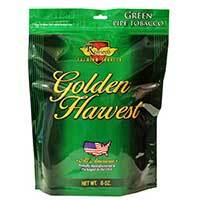 Each bag is packed in a thick pouch that reseals to ensure freshness until the last tobacco is used. Made in North Carolina by Rouseco, Inc., this tobacco brand has decades of experience, so they know how to really make quality tobacco products! With a few options to choose from, you’ll be able to find the right Golden Harvest Pipe Tobacco for your personal preferences. 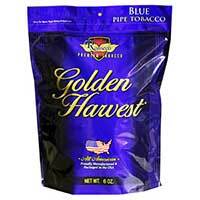 Golden Harvest Pipe Tobacco Natural features no chemicals or flavorings in order for you to experience tobacco as it should be tasted! 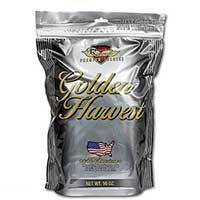 The pure tobacco blend is smooth, yet bold, allowing your taste buds to savor each hit you take. Silver is a bit aromatic with no real harsh aftertaste. The Mint offering provides a smooth minty flavor that is refreshing, yet strong! You’ll love its aromatic balance. 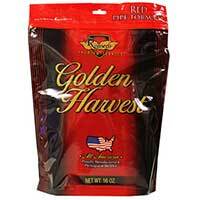 The Golden Harvest Pipe Tobacco Mild Blend is a lighter take on the classic blend, providing smokers with a subtle flavor for a rich experience. The Robust blend is your typical bold tobacco offering that’s full-bodied and filled with lots of wonderful flavor.